Dario Fo’s 1974 political satire about a group of women who decide to raid a local grocery store in protest of the high prices and low wages that are plaguing their working class neighborhood remains as biting and pertinent today as it did when it was first written nearly forty years ago. Fo enjoys playing with a variety of theatrical conventions and traditions in order to expose the social and economic inequalities of the contemporary world; these techniques include elements of fast-paced, slapstick-èsque physical comedy reminiscent of the Italian Commedia, simple plots and self-conscious staging methods à la the Absurdist movement, as well as a highly stylized, quasi-expressionistic performance mode that ruptures the fourth wall and breaks free from the prison of realism that dominates the majority of Anglo-American theatre. It is truly a wonderfully composed piece of dramaturgy that is well-balanced, texturally rich and dynamic. And the director, Jane Nichols, has done an excellent job of remaining faithful to the overall spirit of the text. Her production of this Italian farce is both lively and colorful, as it incorporates a flashy, kaleidoscopic color palette in terms of costumes and scenery, and includes some mind-bogglingly quick costume changes. Stealing the show is Adam Standley, who plays “State Trooper et al”. Mr. Standley’s mastery of physical comedy is nothing short of amazing. He is hilarious in his various roles representing the not-so-swift Italian police force. His portrayal is a mixture of a French-like Inspector Clouseau with a Catalonian accent and decked out in Italian police garb. He gives the strongest performance in the show by far, and it would not be surprising to see him nominated for a few Best Actor awards in local theatre award ceremonies. The rest of the cast, however, which includes Burton Curtis as “Giovanni”, Tracy Michelle Hughes as “Antonia”, Kylee Roussellot as “Margherita”, G. Valmont Thomas as “Luiggi” and Skylar Tatro as “Jr. State Trooper”, was just not on the same par as Standley. This is not to say that they did not do an OK job in their respective roles, but they just did not have the same flair and panache as he, which is unfortunate. And had they been at that same level, this production could have been a knockout because the rest of the elements are there in both the whimsical costume designs by Deb Trout, and in the brightly-colored, cartoon-like set design by Jennifer Zeyl. But as it is, the show is somewhat hindered by the majority of the weaker performers. 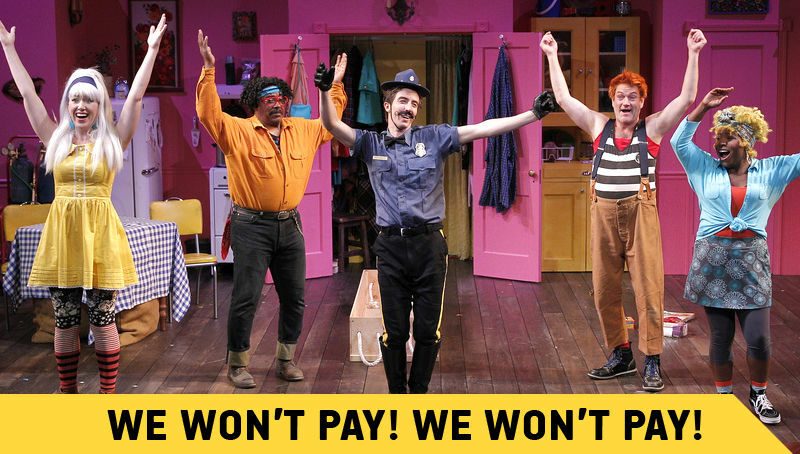 All in all, “We Won’t Pay” is an entertaining and thought-provoking production, however. It deals with very relevant and serious themes, but does so in a very fun and agreeable way. It is not like your typical American comedy, however, and so some may not appreciate its theatrical style, but I, for one, did.